Linnaea, a plant of the honeysuckle family, popularly known as the twin flower. The custom of naming the genera of plants in honor of botanists obtained before the time of Linnaeus, and has been continued by later systematists to such an extent that there is scarcely a botanist of any note, or person who has aided in any marked manner to develop botanical science, but has a genus named in his honor. Where there are so many genera with personal names, it is particularly fortunate that the genus which bears that of the great master should be distinct and peculiar, and that it should be identified with his early labors. Linnaeus collected the plant while on his journey to Lapland, according to his journal, on May 29, 1732. The well known picture of Linnaeus at the age of 18 represents him with this flower in his hand. 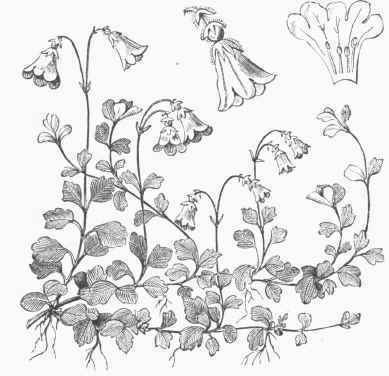 Later it was named by Gronovius, with the assent of Linnaeus, Linncea borealis. The plant is a beautiful little prostrate evergreen, the slender branches of which trail along the ground and bear small roundish leaves in pairs, which cover the surface with a dense carpet of its tiny foliage; the stem sends up at intervals short erect branches, each of which bears at the summit two graceful, drooping, bell-shaped flowers white or light pink, and very fragrant. But one species is known, and this has a wide distribution, it being found throughout northern Europe, Asia, and North America; in this country it occurs as far south as Maryland, and is very common northward, especially in pine woods. Although a little impatient of removal, when once established it will grow luxuriantly upon an ordinary rockwork.